“And God said, ‘Let there be light’… God saw that the light was good, and separated the light from the darkness.” The decree, clearly painted on the black paneled set of Boston University On Broadway’s production of “Godspell,” serves as the only noteworthy aspect of an otherwise basic stage. The musical relies not on grandiose visual effects but rather on the exuberance of the performers. Its set — albeit minimalistic at first sight — effectively serves as a dynamic backdrop to the many stories told throughout the show. Lessons taught in a series of parables throughout the first act fill the initially blank walls with reminders in pastel, written by the cast members as the show progresses. Coupled with chipper phrases and audience-generated doodles, it chalks up to an enlivened, if haphazard, visual representation of the first act of the show. The first act consists entirely of a series of parables, played out by an eager, almost hyperactive ensemble as they are told by Jesus (Christopher Kuiken, a senior in College of Arts and Sciences). As a result of the choppy proportions of musical numbers to spoken parts, the show takes a moment to find its footing before it can take strides in high-energy, ecstatic arrangements. In the role of Jesus, Kuiken radiates joy and fresh-faced exuberance of heavenly proportions. Dylan Herina, a junior in College of Engineering, plays Judas as a distinctly more pessimistic from the first scenes. The weight of foreshadowed betrayal seems to bear down on Herina’s performance long before it is alluded to in the show, but it is unclear whether or not that dampening sobriety is intentional. Nevertheless, performances from both Kuiken and Herina are strong and cultivate an intriguing dynamic in their interactions. In contrast to Judas’ negative — and at times humorous — sarcasm, Jesus is an illuminated bulb of positivity who offers reassurance to the onstage ensemble and the audience at large. Despite the fact that the show’s trajectory follows the later life and death of Jesus, each member of the ensemble still gets a moment to showcase their talents. The musical numbers offer an abundance of opportunities for solos and vibrating high notes, and the performers that assume the varied pitches of the songs do them more than justice. Here is where “Godspell” excels: in high-energy songs of nearly every genre and appropriately angelic harmonies. When sitting through the charades, Pictionary and scrambled assemblies of the spoken parables, one cannot help but yearn for the moment a musician strikes a chord to introduce a new melody. With each new song is a new jolt of energy that keeps audiences engaged, but waiting for that energy highlights one of the flaws of the show’s arrangement. The jumpy, fragmented sensation creates more than discomfort from orchestration — or rather, a lack thereof — as the all-inclusive nature of music can be overpowered by religious underpinnings. Because it is based on the Bible, the musical runs the risk of feeling preachy to non-Christians. However, the messages of its parables are universal and offer an upbeat approach to morality that can appeal to those of all religions. That religious component is unavoidable and is perhaps a flaw of the show. Whereas the first act’s universality is coupled with short songs and an intentionally distracted ensemble, the second act’s musical flow and profoundly emotional depiction of the passion of the Christ is undeniably non-secular. The circumstances of the production’s arrangement are unfortunate in this notion of religion, which may feel alienating to those unfamiliar with the tale of Christ’s final days. This is by no means a fault of On Broadway’s rendition. Rather, the original script and score may be to blame. Although the plot of the second act may lack the positive, modern applicability of the first act, it is in the fluid and gut-wrenching post-intermission numbers that the ensemble catches a wave of poignancy and rides it all the way to the curtain call. While somber, the second act is also noticeably sleeker and enrapturing, with passionate performances on all parts, so much so that any discomforts of the first act are worth enduring for the impact of the tragic second half. 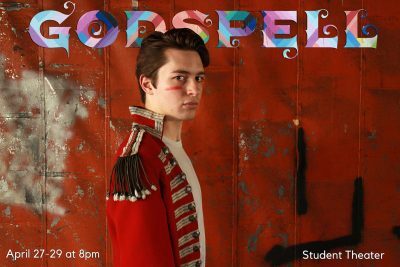 Ultimately, “Godspell” is an enjoyable musical, but it takes some time to strike a chord. The flaws of the musical are, to an extent, remedied by the delightful and impactful performances of the cast. Audiences should keep in mind that the best parts of the show are also the most sorrowful, and require enduring a bit of discomfort before witnessing what On Broadway does best: charismatic, deeply emotional productions bound to leave audiences grateful for the experience.